You have probably picked up on the fact that Nial and I have a very sweet tooth!! 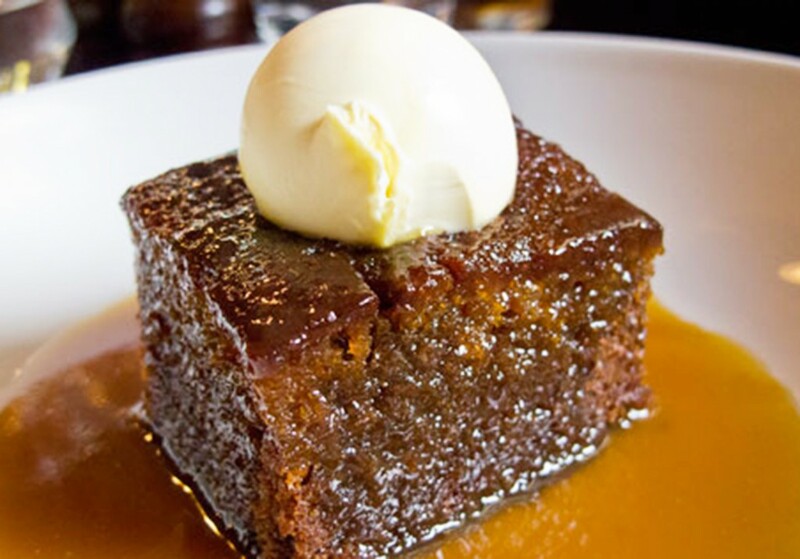 As the days continue to get colder and wetter, it’s time to bring out an old faithful recipe; Sticky Toffee Pudding. This is my favourite sticky toffee pudding recipe and I’ve been baking it for a few years now. It actually came from a James Martin book but I can’t remember which one now!! It’s a truly rich pudding but not overly sweet. It’s very easy to make, and also something which you will have fun doing. The cake itself is extremely moist and it is a very comforting dessert that is perfect for these long winter evenings. There’s plenty of toffee sauce with this recipe so if you have any left over, it’s a perfect accompaniment to vanilla ice-cream. We’ll be sharing our own homemade vanilla ice-cream recipe soon so keep an eye out for it! The sponge and sauce can be made in advance, and the sponge can even be frozen, if you wish to prepare it in advance of a big dinner party or meal with friends and family. Both the pudding and toffee sauce can be plated up and re-heated from frozen in the microwave. Pre-heat your oven to 200°C/400°F/ Gas Mark 6. Grease a 23cm tin thoroughly with 25g of butter, then dust the inside of the tin with flour. This will stop the pudding sticking to the tin. Using an electric mixer, blend the remaining butter (50g) and sugar together. Slowly add the golden syrup, treacle, eggs and vanilla extract to the butter mixture and continue mixing. Gradually add the flour and mix slowly until all of the ingredients are combined. Place the dates in a saucepan with 300ml of water and bring to the boil. Purée the water and date mixture and add the bicarbonate of soda (it will bubble!!). While the date mixture is still hot, quickly add this mixture to the egg mix. Once the mix is combined, pour into the prepared tin and bake for 40-45 minutes until the top is just firm to the touch – be careful not to burn it. You can test the sponge is cooked by piercing it with a skewer. If the skewer comes out clean, the pudding is cooked right through. If there is residue on the skewer, put the pudding back in the oven for 2 – 3 minutes and repeat. Once the sponge is cooked through, remove it from the oven and allow it to cool in the tin. Carefully using a knife, go around the edge of the tin. This should result in the pudding coming away from the edges of the tin. Turn the pudding out of the tin and cut into portions. To make the toffee sauce, melt the butter and sugar together in a small pan, adding the cream. Bring this mix to the boil and simmer for a few minutes until the sauce reaches the desired consistency. The sauce will firm up when cooled but can easily be reheated in the microwave. We have suggested serving your sticky toffee pudding with ice cream. Are you a fan of ice cream with sticky toffee pudding or do you opt for something different like fresh cream or custard? Let us know by commenting below or connecting with us on Facebook and Twitter.